This blog will talk about signs and symptoms of ACL tear. 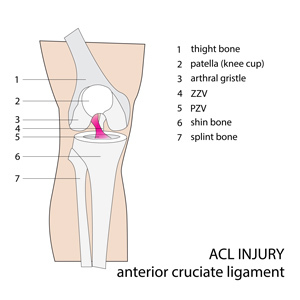 The Anterior Cruciate Ligament, or ACL, is a very important structure of the knee joint. Its main function is to stop the shin bone from moving too far forward when the knee is straightened. The ACL also prevents the knee from rotating too far inward. As a result, a tear to this ligament can have very negative effects on knee function and stability. A potential injury to the ACL has fairly easily recognizable signs and symptoms. The mechanism of injury is very important in identifying an ACL injury. The ACL ligament is often injured when the leg is pivoted with the foot planted. It can also result from a direct blow to the outside of the knee. It is common to see ACL injuries in soccer and basketball because these types of movements happen quite often with these sports. A key sign of an ACL injury is the distinct “popping” or snapping sound that is heard at the time of the injury. The presence of intense pain near the top of the shin bone also relates to the ACL. The immediate presence of a lot of swelling within 2 hours of the injury is another important symptom of ACL tear. With some other common knee injuries, swelling is very minimal or occurs much later. The inability to weight bear on your knee is another clue that it might be an ACL injury. 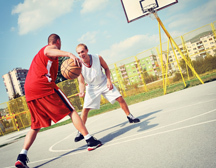 The degree of ACL injury can vary from a partial tear to a full rupture. There are special tests that can be done to confirm the presence of an ACL injury and test the extent of the tear. However an MRI will provide the most detailed information about this type of injury. Surgery may be recommended if it is a full ACL tear. However, some individuals will opt to not proceed with surgical intervention. Instead, they proceed with conservative treatments such as Physiotherapy and Custom Knee Bracing. Patients with partial ACL tears will definitely require Physiotherapy treatment. This will promote healing, regain strength and optimal function. Check out this link for further information regarding symptoms of ACL tear. A fully trained Registered Physiotherapist will be able to guide you through an appropriate rehabilitation program so that strength and stability is restored in the knee. The goal is to return you to play and competition as quickly as possible! If you or someone you know has suffered from symptoms of ACL tear, please call PhysioNow today. We have fully trained, Registered Physiotherapists ready to help! 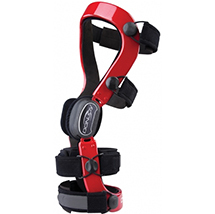 We also have fully trained staff able to guide you in your decision if you decide that you would like a knee brace. Both off the shelf and Custom Knee Bracing is available at all of the PhysioNow offices. Call today to get started on your recovery.